Rabbi Nechemye Hoffman is the founder and Director of Kollel Chatzos. A young father of three, he started the first kollel in Beitar Illit, Israel in 2011. He had just 14 members and a dream. Four years later there are four locations and the power and zechus of supporting limud hatorah, especially at chatzos, is reverberating across the globe. Rabbi Hoffman explained more about the program. Kollel Chatzos is program that supports all night Torah study to support Am Yisroel. Every night at a little past midnight, close to 100 young talmidei chachomim in Brooklyn, Monsey, Monroe and Meron, leave home to learn in Kollel throughout the night. People are shocked when they see the yungerleit running in to shul at that time, with tallis and tefillin in hand. It’s inspiring to see such excitement for learning when everyone else is going to sleep! Recently, a wealthy man happened to be standing outside the shul when one of the cars pulled up. He wondered out loud what they were doing and was so moved, he gave $50 to each kollel member right then and there. What differentiates Kollel Chatzos from other organizations of the same name? We are the only kollel in Eretz Yisroel with regular, young kollel members learning the standard range of Torah. Walk in to any of our locations at 3 am and you’ll think you stepped in to a normal, vibrant day kollel. In America we are the only Kollel Chatzos and the only kollel learning throughout the night. Describe a night in Kollel Chatzos. The members are picked up (since it is the middle of the night, we provide transportation) and Kollel begins promptly at 12:45 with Maariv. Then they settle in to learn. Some chazer what they learned during the day, some learn b’chavrusa. Others participate in Dirshu; Maggidei Shiur prepare and there is a Dayan who reviews shailos and learns Shulchan Oruch. Many say tikun chatzos. Each member has a list of names specific to their kollel to keep in mind while they learn. At some point he takes out the paper and recites the names with sincerity. We keep the lists relatively small and these exemplary talmidei chachomim develop a strong spiritual connection to the names they daven for; if a name is taken off the list, they notice. They learn until daybreak and daven Shacharis at netz. There is something very special about a davening that comes after an entire night of being immersed in Torah! Then the members head home to eat breakfast and help with the family and sleep for a couple of hours. By ten o’clock in the morning they are back in their regular day kollel. So they learn day and night?! Yes. They get home from day kollel, eat supper and help with the kids, go to sleep at about 8:30 pm for four hours and then wake up and head to Kollel Chatzos for the night. It is an intense way of life, but the kollel members who commit to it can’t imagine anything else. In fact, there’s a huge waiting list in each city. What type of person signs up for Kollel Chatzos? Yungerleit ages 25-30; deeply committed to learning Torah; they must be learning during the day as well. When someone applies we meet with him and ask, ‘What is your plan for learning and what is your plan for your home life? When will you sleep?” They must be able to sleep for four hours before they come. When someone is accepted, he is committed for one zman. 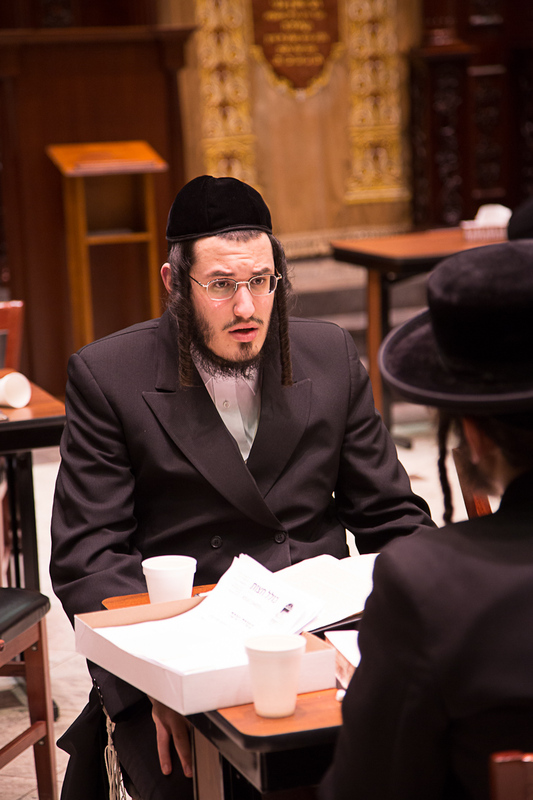 For most kollel members, there is an adjustment period, but then it becomes a way of life. The application actually requires the wife’s signature stating that she agrees and supports this decision, just like for Hatzolah members. Some wives even add that it is a zechus and an honor. During the year we plan support groups for the women, and inspirational speakers; before Pesach we give out bonus coupons, and before Shavuos we give a bag filled with milchig items and a beautiful letter thanking the wives. How did the Kollel get started? When I was a bochur learning in the Mir, I was zoche to get to know a tremendous talmid chochom and mechaber seforim who shared with me that it is a life changing experience to learn the Zohar. I went to Meron for Lag b’Omer and bought myself a small set of Zohar and found it very inspiring. Rabbi Shimon bar Yochai states over and over that chatzos halaila is such a special time to learn, so I decided to try. I davened Maariv in the first minyan in yeshiva, went to sleep and woke up at 12 am. I had the key to a Bais Medrash in Meah Shearim; I let myself in and learned, alone, the whole night. Then I got married and settled in Monroe, with a regular day kollel schedule, but I really missed the chatzos halaila learning and always talked about it. About a year and a half after I got married, my wife urged me to use our chasunah savings to open a kollel. I went to various Gedolim for haskama and put a small ad in the classifieds. I started two weeks later with 14 people. How did one small kollel grow into four locations and a world renowned source for the zechusim of limud hatorah? The Rashash brings an incredible chiddush: if someone cannot stay up to learn the night of his baby’s vachnacht, he can ask someone else to learn on his behalf and it is as if he himself learned for his baby the entire night. I realized that this was a potential way to help support the kollel while providing new fathers with an avenue to have a shmira and a zechus for their baby. We started advertising and more people signed up for the zechus of having the kollel learn throughout the night. It grew from there. What do you think appeals to people most? When people hear the power and zechus of supporting the kollel, and the yeshuos it brings, they realize that there is definitely a koach to supporting Torah being learned b’chatzos halailah. There have always been those who feel a deep connection to segulos and yeshuos. Now people across the board are recognizing the tremendous zechus in helping ensure there is never a moment without Torah being learned, especially during the night. When you consider the time difference between the Kollel Chatzos locations in America and Eretz Yisroel, it means that in essence Torah is being learned non-stop from 6 pm to 6 am. Add this torah learning to the rest of Torah being learned during the day throughout the world and Torah is being learned 24 hours a day. You give people the opportunity to become a partner with Kollel Chatzos by making donations. What do you use the donations for? The money goes exclusively to the kollel members and it pays administrative costs that are needed as we raise funds for the kollelim. Without this financing, we would not be able to pay the kollel members and the families would not have the ability to live this elevated and exceptional life of Torah. The more money raised, the more I can give to each kollel member and the more locations I can open. I would like a Kollel Chatzos in every city with enough money to include as many kollel members as possible. And ultimately, that each kollel chatzos should be a full day kollel as well.